Our prices All prices are based on per person per night/day and include VAT at 20%. Our Camping fees are split into High, Mid and Low season prices and are correct for dates during 2019. View the price calendar for each product to check exact prices. When booking please state the number of people and whether they are adults, children or infants as we do not facilitate any open ended camping bookings. We do NOT charge for tent pitches, tents, gazebos, cars, camper-vans, awnings or bikes. Camping prices are based per person per night. Infants aged 3 and under camp for FREE. Check-in Low Season 10am - 6pm, Mid Season 10am - 7pm, High Season 10am - 8pm only. Please view the Adult only Friday or Saturday single night rates on the price calendar. A minimum of a 2 night rate applies on any Bank Holiday dates (even for a 1 night stay). If you want to use the camping centre between 10am and 8pm or would like to spend the afternoon on site after your departure time, then you would need to pay the day rate fee. Persons staying on site or parking cars in the car park for more than 1hr (Day Visitor rates will apply). To maintain our historical association with Scout/Guide and School groups we therefore offer a discounted camping rate to organised camps for these groups. Please note this discount is not available for individuals or families, only the Scout/Guide and School groups who we will invoice directly. The Camping centre can accommodate a small number of camper-vans, Caravans and small motorhomes on the camping field. Sadly can not accept any large caravans (twin axle), Winnebagos or Large Caravanettes/Motorhomes as roads going into the village are not suitable (max length 21ft/6.5m). 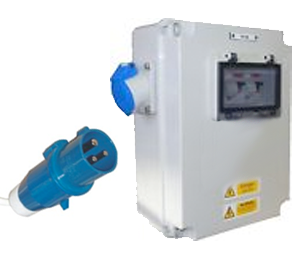 If you require a electric hook-up point you should add an electric pitch to your reservation if available. Please note: It may not always be possible to check-in before 1pm because of previous guests departing from the electric pitches. This is a 16Amp electrical hook-up point and requires the correct connecting cable shown in this picture. We do not supply hook-up cables and all our electric pitches are on grass with sea views. The price is a per night hire rate. We will deliver to your tent and supply some paper/card to get you started. 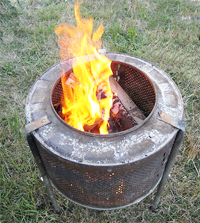 Bags of logs are sold at reception or guests are welcome to bring their own wood. 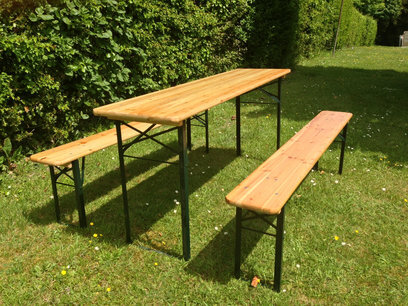 Our trestle table and bench sets are delivered to your tent and can seat up to 6 - 8 people, with a table top dimension of 2m x 75cm. 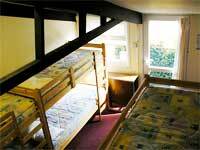 Our large Crew Lodge indoor accommodation will sleep groups of up to 16 people. This accommodations facilities include a kitchen, lounge with TV and dining tables, plus 2 bathrooms and 3 bedrooms (2x sleep 6 bedrooms and 1x sleep 4 bedrooms). See the Indoor Accommodation Plan view on the DOWNLOADS page. Please note: Bedding is not provided - So you will need to bring your own single linen sets (duvet covers and sheets) or a sleeping bags. Only 1 key is issued upon arrival. A Cabin room will sleep up to 6 people and all have 3x bunk beds inside. The Cabin rooms are not interconnected to the larger Crew Lodge accommodation and they have NO kitchen facilities. All of the Cabin rooms share the neighbouring toilet and shower facilities. Please note: Bedding is not provided - So you will need to bring your own single linen sets (duvet covers and sheets) or sleeping bags. Only 1 key is issued upon arrival. This is not a communal kitchen area for all campers (Only groups hiring this facility have a key and permitted use) Large refrigerator, freezer, tables and benches, 3 ring gas burners, a field gas burner oven, a microwave, hot and cold water (twin sink), 5 trestle tables and 10 benches. Please note: Kitchen utensils and cookware are NOT included. Only 1x gas bottle is provided per hire. Additional bottles available on request at an extra cost.